Built in 2008 this house is still like new. First level features nice equipped kitchen with kitchenette area that seats four, living room that also has a dining area that seats six and three bedrooms: one king master with bathroom, one queen, and one twin/full bunk bed and a shared hall bathroom. Each Bedroom has a smart T.V. Also, off the kitchen is an awesome deck with charcoal grill! Lower walkout level features Two bedrooms: one king and one queen each with smart T.V. 's and one shared bath, a nice big rec room with sofa bed, Big screen T.V., fireplace, bar area, dinning table that seats 6 and great view of the lake! Walkout to a nice patio just steps from the dock! Also, level grass back yard leading to a dock. The dock is a 2 well with 2 20'x 10' slip and 1 swim platform that is 10 x 24. We have a fish cleaning station on the dock so please clean those stinky fish down there! We also have two four person paddle boats that are a lot of fun for the kids and adults. We have plenty of Parking that can be used for boat trailers just off the road on on our extra lot. Coconuts bar and grill is just a short boat ride away! It has a sandy beach for the kids with play ground and a water slide and a pool with a swim up bar! Definitely check this out! Hello, we are the Sperry and Inman families. We are a brother and sister that built this home together in 2007. We did not realize how much this home would impact our lives. It houses many unforgettable memories that our families and friends have shared. We hope each and every one of you enjoy our lake house as much as we do. We always visited the lake and enjoyed boating and skiing and fishing. We would rent other places or we even used an R.V. for a while. One rainy day we decided to look at property and stumbled across a lot in the back of a quiet cove. Our dreams started there. We decided to build a home there and the rest is history. This location is quiet and peaceful. The kids can swim off the dock and have no worries about boat traffic. It is perfect for a family getaway. In a quiet cove with virtually no boat traffic. Perfect for families with kids. Great for swimming and relaxing in the water. This house offers three areas for dining. Kitchen offers a table for 4. Dining area has a table for six. Down stairs there is a table for 6 also. Outside dining offers seating for 12 also. There is a paddle boat on site for you to use. Best place we have ever stayed at so far! This place was awesome had a great stay,Had everything we were looking for!Great place to take the family and friends!We will be back next year! Stayed here for a long weekend in Mid August for a getaway. Was very impressed with the cleanliness and overall upkeep of home! House had all the amenities we needed. Bedrooms were in pristine condition and quite comfortable. We had a group of 6 so the house was more than spacious and accommodating for us. Back deck is great for relaxing and grilling while the dock was perfect as we rented a boat and utilized the on-site paddle boats! All instructions for house were simple and easy to follow and Dennis promptly responded with all questions we had prior to visit. 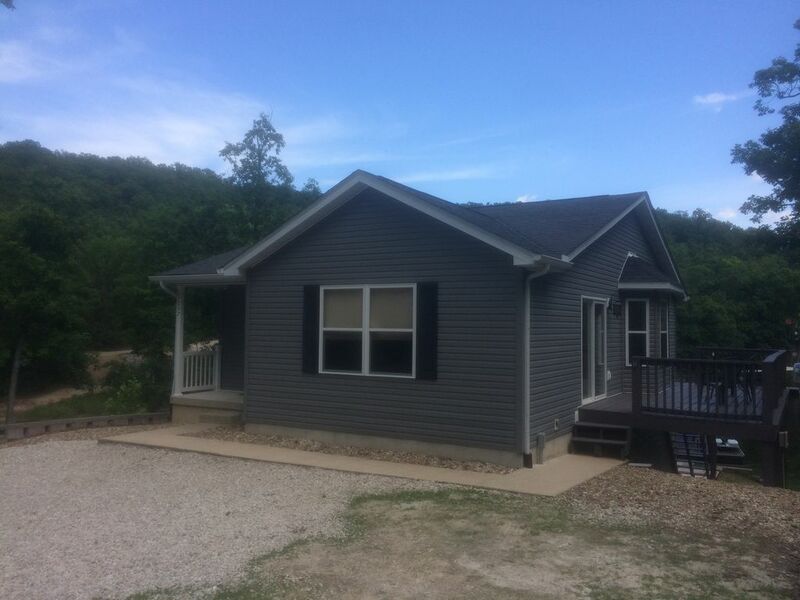 Overall, very pleased with property and would highly recommend to anyone looking to get away to the Ozarks. Thanks for everything! We had the greatest time. The house was perfect, comfortable and well equipped with all the comforts of home. We had an amazing time at your home! It’s beautifully kept and well equipped! Dennis was amazingly responsive to questions and we were able to explore the lake with our boat and the kids had a blast on the paddle boats! Thank you so much for the great stay! The lake-front property was great!! Our party of 8 had more room than we needed in this comfortable, lake-front property located on a quiet cove. We brought our 20' pontoon boat and enjoyed keeping it at the floating, covered dock. We enjoyed the 'porch' swing and 2 paddle boats at the dock and swam each suitable day. The clean house suited our needs (well-equipped kitchen, 5 bedrooms, 3 bathrooms, full-sized laundry) and the memories we made here will last forever! The owner responded to questions promptly... we would highly recommend!! Simply wonderful!, We all look forward to returning to that same house hopefully next year. There was plenty of room for all of us! The dock and the paddle boats awesome. We are right around the corner by water from Coconuts at The Lake where you can rent a ski boat, tritoon or 3 person jet skis at their gas dock. ◦Play games! New basketball court, sand volleyball, ladder golf & washers! For the kids - water trampoline, new expanded playground on the beach, 3-hole miniature golf, and ice cream shack! ◦Sit back and enjoy our unobstructed 2 ½ mile view from our new expanded pool and enjoy a cocktail from one of their two pool bars. Great fir kids and adults!